It was an impressive Winter Belt Ceremony. It was the largest belt ceremony so far. Like last year, Royce Gracie and the Valente Brothers combined black belt testing. 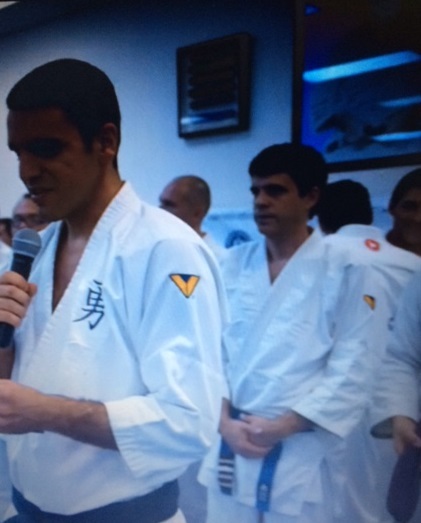 Valente brothers promoted its first woman black belt. There were people here from all over the world. I appreciated the high caliber of the students of both Royce and the Valente Brothers. On the mat we were one. There was also an honorary black belt presented to Nelson Semedo’s wife and child. Last year, Nelson came to Miami for black belt testing and died from a stroke. Apparently, he didn’t know about his own bad health. After three years of study, I was promoted to Purple belt. This ends the blue belt journey. To say the least, it was a great experience. I will follow up with some last commentaries in few days. FYI, I will probably start writing another blog in regards to purple belt but on a month to month basis. I will keep you advised.